Panzer Grenadier: Liberation 1944 features intense tank and infantry battles between the British Army and the Germans in North-West France, but it has something extra: very strange armored fighting vehicles. Imperial Germany had been a rich country and one of the world’s leading industrial powers. Defeat and depression made Nazi Germany much less economically formidable; German engineers could design modern weapons, but the factories and finances to build them were lacking. And so the Germans looked to the huge stockpiles of equipment taken from their defeated enemies to help bridge that gap. Major Alfred Becker, an artillery officer, had used captured Dutch, British and French vehicles to create self-propelled mountings for his regiment’s guns. His work came to the attention of Adolf Hitler, who personally ordered him to create a workshop in Paris to re-work enough enemy vehicles to equip at least two panzer divisions. Becker and his men converted hundreds of tanks, half-tracks and other vehicles into self-propelled guns, tank destroyers and ammunition carriers. They did not produce enough to fit out a pair of panzer divisions, but for a time their creations did supply most of the armor for the rebuilt 21st Panzer Division. 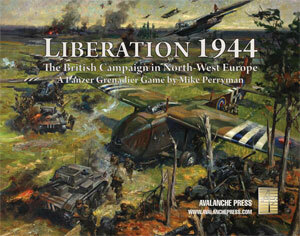 And many of them appear in Liberation 1944. As an artilleryman, Becker gave a great deal of attention to self-propelled mounts for the standard German 105mm and 150mm artillery pieces. The Germans captured a great deal of French weaponry, including hundreds of artillery pieces, but Becker concentrated on making the German guns more mobile rather than introducing French-made ones into German service. Many of Becker’s designs placed the standard German light howitzer, the 105mm leFH18, on a fully-tracked chassis. Becker used a variety of French light tanks for his conversions, as well as Lorraine fully-tracked carriers. The designs differed slightly based on the size and shape of the base vehicle, but had in common an armored box sited on the back end of the chassis to protect the gun crew. The performance of the various models didn’t differ enough to be reflected in game ratings, so they’re all represented in Liberation 1944 by the Marder 105. Becker spent a few months as a consultant with Alkett, the producer of many German tanks; later Alkett built the armored bodies for the re-built vehicles to Becker’s specifications. Impressed at Becker’s success in turning cast-off tank chassis into useful armored vehicles, Alkett’s designers looked to them for inspiration when mounting the 105mm leFH18 on the German Panzer II light tank chassis. Alkett subcontracted the actual assembly work to FAMO, who built nearly 700 of the Wespe self-propelled guns at the Ursus Tractor Works in Warsaw. Antitank guns also received the same treatment. Becker at first mounted 75mm PAK 40 anti-tank guns on Lorraine carriers, using a design very similar to that of his artillery carriers. The Marder I, as it was named, also used discarded French light tanks and a few Polish tanks as well. About 170 of them were re-built at his workshop outside Paris, and went to the anti-tank battalions of infantry divisions in France and the re-building 21st Panzer Division. The Marder III was inspired by Becker’s work, but designed at Alkett using the chassis of outdated Czech-built light tanks. Skoda, the Czech producer of the original LT38 (PzKpfw 38t in German parlance) tanks taken over by the Germans, had come under ownership of a conglomerate headed by influential Nazi Hermann Goering and his brother, and managed to wrangle a contract to make hundreds more new versions of the vehicles once all of the usable discarded chassis had been used. The first examples of the Marder III carried the Soviet-made 76.2mm F22 field gun, re-chambered to use German 75mm ammunition. Later models had the German-made 75mm gun. A variation of the Marder, built alongside it on the discarded hulls of LT38 tanks, carried a 150mm infantry gun. The Grille (“Cricket”) project used a mixture of old tanks and new chassis built for the purpose. The vehicle served in the Panzer Grenadier regimental infantry gun companies of panzer divisions, with about 200 of them built. Another variation of the basic Marder design, the Flakpanzer 38 did not receive the name of an insect or predatory beast. Instead it soldiered on from 1943 until the end of the war under its boring but accurate designation: a single 20mm anti-aircraft gun mounted on an LT38 chassis, using a design closely derived from the Marder/Cricket. About 140 of them were built, with most serving with panzer divisions in France, including of course the 21st Panzer Division. Becker and his team made great use of rockets to increase mobile “artillery” firepower – they were reasonably lightweight, often frightened their intended targets, and could be fired by crews with far less training than conventional artillerymen. While the German Army used rocket launchers known as Nebelwerfer (smoke-throwers), Becker’s team realized that the rockets could actually be launched directly from their wooden packing crates. They weren't likely to hit anything when launched that way, but did fly more or less in the direction of the enemy so they could affect morale. And so the Becker crew bolted these crates onto every conceivable captured vehicle. The fact that they also took many pictures of them leads one to believe these were intended as much for propaganda as the battlefield. Opel, the giant combine which built most of the German Army’s trucks and soft-skinned vehicles, produced a much more sophisticated purpose-built rocket-launching vehicle known as the Maultier (Mule). The Mule had a tremendous kick, and most importantly what would later be known as scoot-and-shoot capability. Becker had been careful to gather and stockpile spare parts for his vehicles, which meant they could be kept in action. Many of Becker’s creations continued in service until the end of the war, though they were always considered temporary stopgaps until purpose-built vehicles could be provided. The 21st Panzer Division finally took delivery of “real” tanks shortly before the Normandy invasion, but still took many of the strange weapons of Alfred Becker into action.